March is around the corner, so get up to the snowy scene before spring says its hello. March is around the corner, so get up to the snowy scene before spring says its hello. Making your way there easier? A fresh package made for fresh snow. MARCH IS GO TIME: The third month of the year is very much about movement, from the basketballs that fly around the court during the college playoffs to the wind that supposedly arrives "in like a lion" at the start of March to kids running to find decorated eggs. There is another seasonal phoosh to consider, though, when pondering the time span, and it is this: Spring arrives, as is tradition, during March, and the whole snow scene around the mountains has a way of slowing down, or at least flirting with bidding its warm-weather farewell. March, in short, is not November, when the promise of upcoming flakes gets skiers into a festive mood. So how do you get in a few more runs before summer draws close? You look for great packages, like the new Lift and Lodging deal at Mammoth Mountain. THE PACKAGE INCLUDES... a starting price point of $149, with "a lift ticket for every night booked at a Mammoth Lodging Collection property" (so think Tamarack Lodge, Juniper Springs Resort, The Village Inn or Mammoth Mountain Inn). This isn't a March-only deal, better yet, though it won't, and can't, of course, last forever: May 30, 2016 is the final date to nab it, if nabbing shall be done. 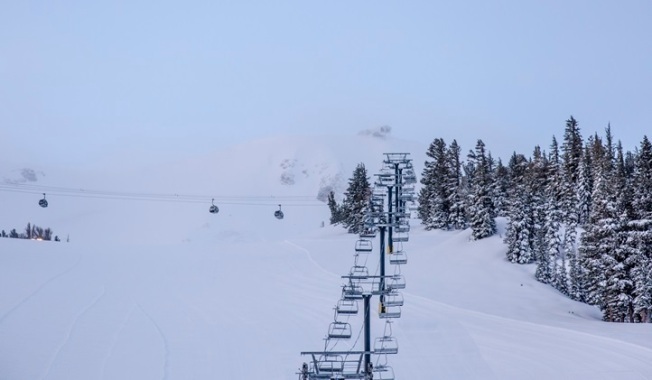 THE PRECIPITATION LEVELS... for the season have landed on the staggering side, with Mammoth Mountain surpassing the previous season's snowfall on Jan. 20, 2016. That's early, for sure, and since then dozens of inches have frosted up the runs. So, what's to come for March, which may bring more snow, in-like-a-lion-style, to the Sierra-located resort? It's hard to prognosticate, but it isn't difficult to foresee this: The Lift and Lodging Package has a shelf life, with a wrap date on the penultimate day of May.